After the official maker nights completed their run, several attendees decided to continue meeting at The Public and have successfully negotiated further meeting dates until the venue doors finally close. 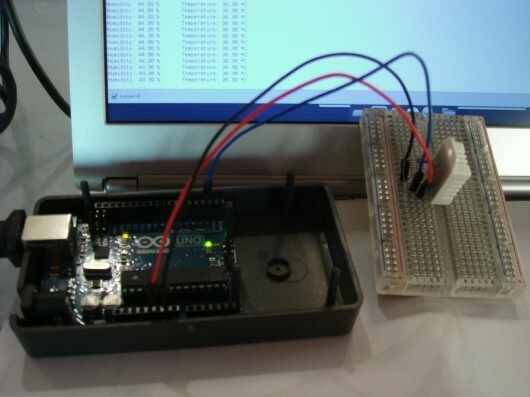 Home automation in development – here we have simple temperature and humidity logging. The next meetings are Tuesday 15th October 2013, and Tuesday 29th October 2013. Please come along and visit. The sessions are self-led and will vary according to who gets involved, so as usual the only requirement is that you’re someone who’d like to get involved! Skills are for sharing – those attending can probably guide you with learning a new skill, or suggesting how to get started on your own project. Drop-in for whatever time works for you; you don’t have to be there for the whole of the session. Doors open 5pm – 9:30pm, it’s free, and we’re usually up on the 3rd floor in the Long Room (ask at reception if you can’t find us). A part of the discussion will be whether the group can continue after the venue closes, and where we could meet in the future. If you are interested in keeping something like this going in Sandwell then please come along.